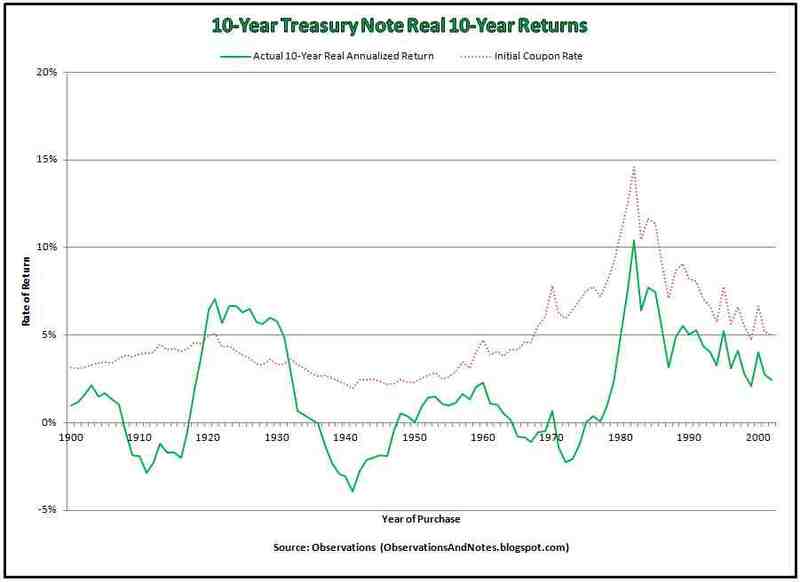 10 Year Treasury Rate - 54 Year Historical Chart; source: Macrotrends. Let me start with two claims I will not pursue in this post: (i) I am very confident that the price of Bitcoin is a bubble (some other time about that). I honestly don't know (ii) if last week's market correction was the start of a downward trend in stock prices or just a minor hiccup in a long-run bull market. This post is not intended to make anybody money or to predict the future (say, in the manner of Donald MacKenzie who wrote about the Volatility Index just before it rose again). Since 1980 headline interest rates have been in full decline. (The inflation adjusted curve has the same shape, but is slightly less striking. The early 70s had historically low real interest rates before the great run-up.) In what follows I treat this, for simplicity's sake as a free-standing cause (and abstract away from the political and economics reasons for this decline). * During this long decline, governments could borrow relatively easily, bond-investors grew rich without much effort, bankers could make easy money in virtue of their license to print money, and it was easy to make money in financial and real estate assets (which made retirement planning for upper-middle class families easy). That, together with stagnating wages, has had huge effects on income distribution (see Piketty). Thirty-seven years is a long time.+ That's longer than the Berlin Wall stood; longer than (ahh) the thirty-years war. That is, expectations have been trained up on falling interest rates; business models and risk models across the economy rely on cheap credit and falling interest rates as an ordinary fact of life. For example, "most deposit models [of big European banks] are based solely on a period of decreasing interest rates and hence might entail high model risk." I suspect nobody really knows what the effects on the financial sector and real economy will be once interest rates have really bottomed. Of course, even if interest rates have bottomed it does not follow they will go up. But I would think that inflation expectations will rise following the combination of tax-cuts, government deficits, discouragement of immigration, and persistent low unemployment. Now, since the last great recession, neo-Fascist parties and sentiments have been growing in popularity all over the world. Leaving aside, say, Greece (which has suffered greatly economically), this has happened during peacetime, relatively low inflation, and -- despite all the challenges -- relatively prosperous times. ** So my worry is, if interest rates rise, and there will be another severe bout of economic dislocation and hardship, will neo-fascism get its lucky break? For my suspicion is that it's precisely when reliable expectations are thwarted that people are willing to be receptive to radical alternatives. *Undoubtedly, Volcker, the decline of unions, automation/computers, and the astounding integration of world markets have something to do with all of this. +Yes, there have been periods when interest rates seemed to move back up a bit. ++Why? Well, the European stress test has been unreliable, and the European banks have not really been recapitalized nor restructured since the Great Recession. **My assumption being that war and high inflation are the most fertile breeding ground for fascism. I'm not sure it's interest rates or inflation that matters, but unemployment. The idea is that white resentment is fueling rise of the right. The risk, then, is not about the lack of reliable expectations about prices, but is instead about higher interest rates causing a recession - and the associated unemployment. The solution in the short-term is for the Fed to let the economy run hot (keep rates low, while letting inflation run up past their target).**. That is only sustainable for so long though. **There's also reason to believe that the longer a recovery goes, the better things are economically for minorities and poor whites.